To a mere passer-by, a tree may be a thing that is there but not noticed. Kristie Rowe is a wry observer and she has a natural inclination to take pause. She peers in and closely inspects the intricacy- the glimmer of a cobweb in the sunlight, the veins intersecting upon a leaf- these ever-changing and enchanting subtleties form a series of artworks in her mind. One of Kristie’s biggest strengths is her curiosity and attention to detail. The changing of the seasons, the sky and the plant life in her surrounds capture her imagination and that of her young children. Art is not an optional component of Kristie Rowe’s living and breathing existence of this earth. Creativity runs through her family, through her home and moves with her as she travels. Alongside her husband Paul and daughters, Melody, four and a half, and Ginger, two, the world is rich with natural beauty. 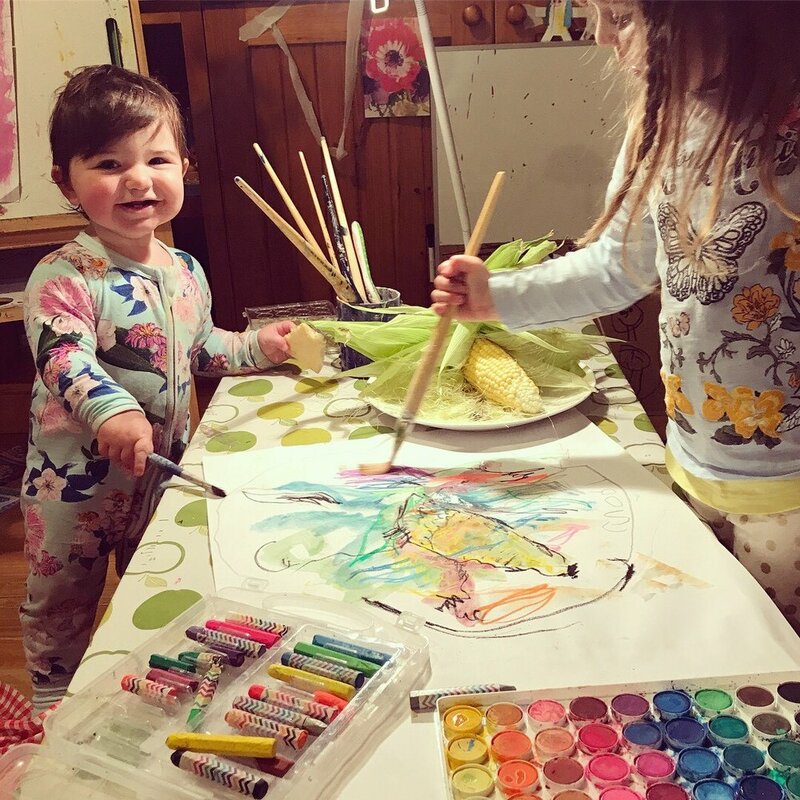 Natural resources befall us all, but unlike many of us, this young family use them and make something of them, giving them a new presence and purpose in the form of art. Kristie Rowe is an artist and has forever been artistically minded. She reaches out to capture the feeling and the colour. Her creations have movement and her art space does, too. Kristie's two young daughters potter and play alongside her in the back studio. There is great freedom to play here. It is not lost of Kristie that play is intrinsically linked to her creativity. “Often it is a result of playing, just enjoying the painting and trying to find something new, something surprising or captivating,” Kristie said. Playing is a natural part of this family household. It is not nomadic play, necessarily. 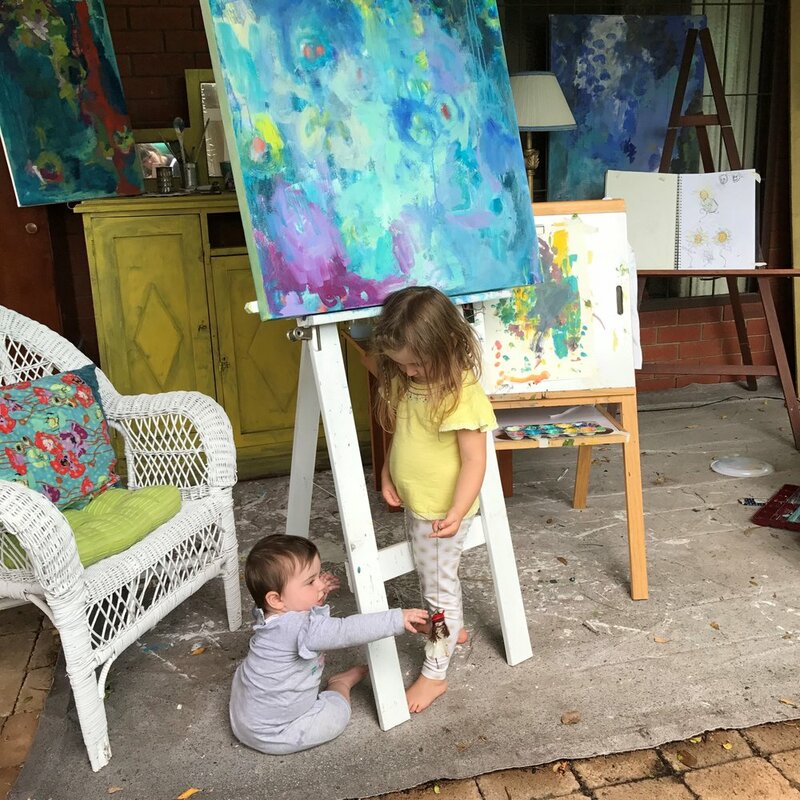 Kristie has ideas and sets her children off with an idea to create. She watches on, seeing how they learn more each day. Prior to having children, Kristie strove for that satisfaction of result. The trajectory of her artistic career has been winding as she explores different mediums. The one constant is her drive to complete the vision. She is not one to dip her toe in, but dives in without fear, giving it her all; wide strokes and deep breathes as she goes. 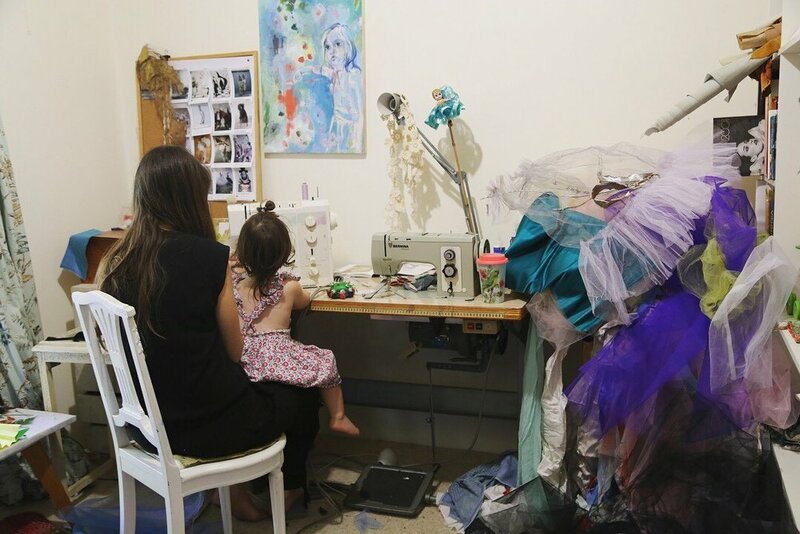 For a decade Kristie and her mother have been the founders and creators of successful bespoke fashion label called House of Snowball and for a time Kristie taught at Whitehouse Institute of Design, leaving a lasting impression on her students. Many years have passed since Kristie taught that student but her passion to share and explore different notions of art prevails. Her own creativity is still blooming and her garden continues to grow. As a mother, Kristie had to transition and rethink the way she works. Her usual routine was often abandoned as her two young children became the focus. Kristie clung to that connection with the outside world beyond her home. When her girls were babies designing and sewing became quite frustrating as it needed to be done in short bursts as interruptions were inevitable. So she sought out another avenue: painting. The car port was converted into a studio. It tumbles into the garden and lead to more creative play. Motherhood has allowed Kristie to reposition herself and value time. Time to dress up and play games. Time to make a mess. Time to play. Time to be together. Strands of creativity are left to be picked up by one another, it seems. Remnants of creativity are generationally passed on. Kristie’s mother is a fashion designer and has a great eye for colour and composition. Like her daughter, she has a knack for creating with her hands. The enjoyment in creating runs through the family and Melody and Ginger thoroughly enjoy their time playing with different art forms. Bit by bit, they absorb the loose strands. 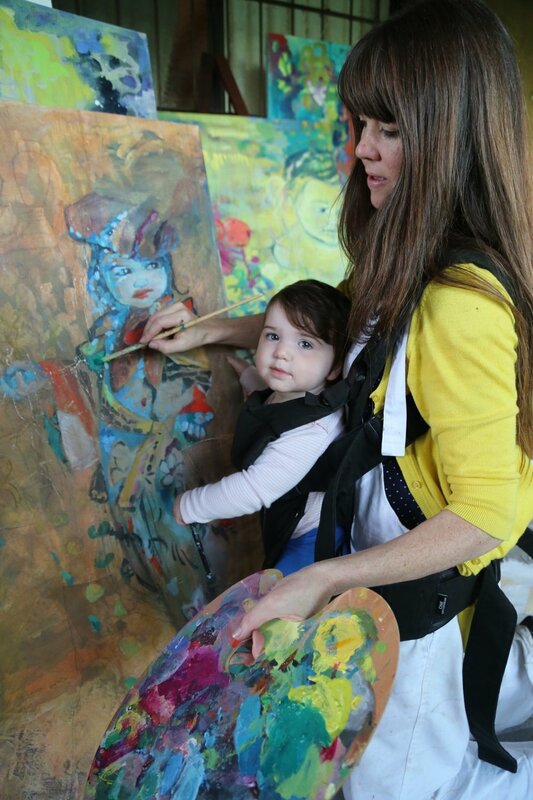 Each day Kristie and her kids do at least one painting, craft activity or experiment. Often several. “I love that they are uninhibited to try and create a realistic representation of what they see or experience. When painting or drawing they put the essentials in to tell the story but in any which way they like which makes it much more captivating and gives you an insight into the way they see the world.,” Kristie observes. Kristie remarks how lucky she is that her daughters love painting and making things as it allows her to indulge in what she loves to do. 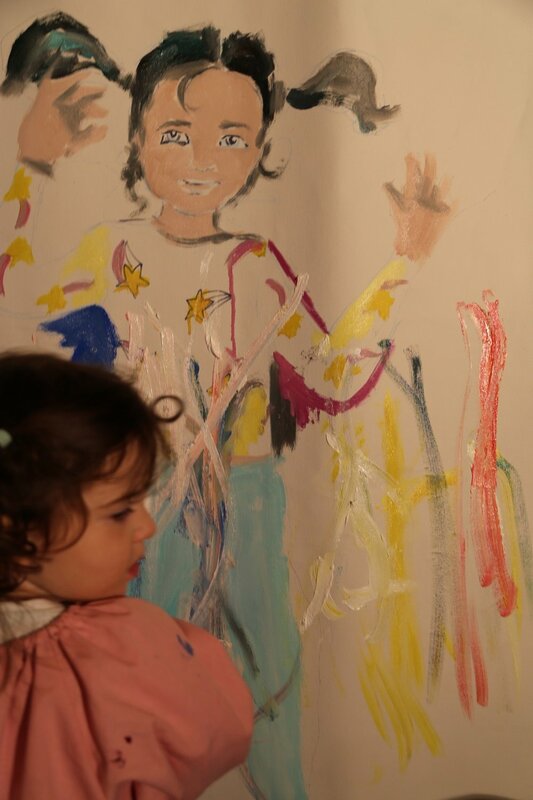 The thing is, they too are the lucky ones to enjoy a childhood so colourful, imaginative and free. All of these creative strands fall and something new begins as Melody and Ginger create beside their mother. From here, stories form.